16.1" x 14.8" stitched on 14 count. 12.6" x 11.5" stitched on 18 count. 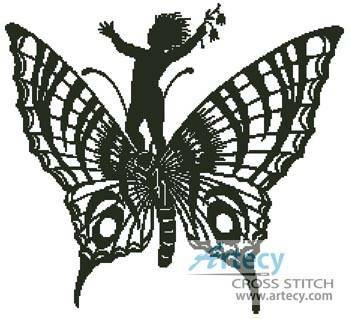 Boy Riding a Butterfly cross stitch pattern... This counted cross stitch pattern was created from antique clipart. It only uses one colour so it is easy to stitch. You could use any colour you like.Only full cross stitches are used in this pattern. It is a black and white symbol pattern.